March 20, 2017  The House Permanent Select Committee on Intelligence has been investigating Russian attempts to influence the U.S. presidential election. On Monday, the committee held an open hearing on the subject. November 16, 2012  After attending a closed-door hearing, a Republican lawmaker insinuated that the CIA assessment of the Benghazi attacks had been changed. A U.S. official tells NPR the talking points were not changed and included references to "extremists." 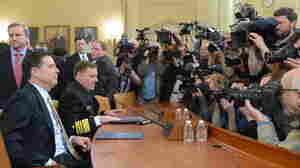 January 7, 2010  In our first hour, the changing role of the C.I.A. and Ellen Burstyn, on The Loss Of A Teardrop Diamond. Then, coverage and analysis of President Obama's comments on a new White House report on Flight 253.